Most of the tools that get covered here at ToolRank have to do with construction; because well, I am a construction worker. Every once in a while I throw in a garden tool just for fun, but for the most part automotive tools get left out. This injustice to automotive tools ends today with the announcement of some new lithium-ion cordless tools from Matco. 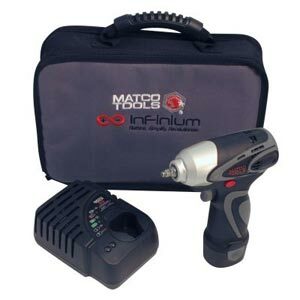 Matco has announced their Infinium line of cordless tools that were specifically developed for professional automotive technicians that require the power of pneumatics but the portability of cordless. Headlining in the Infinium line are three cordless impact wrenches. Their 1/4-inch impact wrench runs off of 10.8-volts and produces 55 foot-pounds of torque. Their 3/8-inch wrench runs off of 14.4-volts and their top dog, the 1/2-inch wrench uses 18-volts to produce 425 foot-pounds of working torque at a weight that is under 7 lbs. Other tools in the Infinium line include a 10.8V mini polisher and drill driver, a 14.4V drill driver and grease gun, and a 18V axle grinder and power shear. Each tool can be purchased as a kit (with battery and charger) or they can be purchased as tool only.